Finally a chance for kids to get connected to the Horn Farm! We are excited to offer four short sessions for children, aged 6-12, in our new Children's Discovery Series beginning April 28. Each class runs an hour and a half. Register for individual days or the four part series. Benefits of experiencing the natural world include increased self-esteem and resilience against stress and adversity; improved concentration, learning, creativity, cognitive development, cooperation, flexibility, and self-awareness. 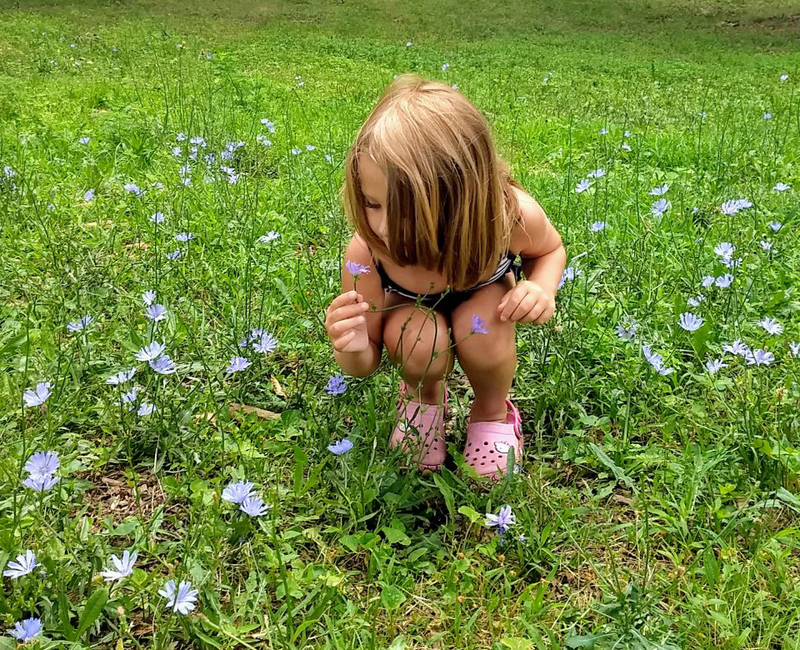 Through positive experiences outdoors, children will develop their love of nature and a foundation for the development of responsible environmental behavior. Hands on experience with a bit of freedom for creative exploration engages and inspires children to cultivate a sense of wonder and connection. We will be learning about the web of life and our part in it, engaging in some fun nature-oriented mindfulness games, playing in the dirt, getting silly, and leaving no trace in the process! Children are encouraged to dress comfortably in clothes that can get dirty! These classes are being offered as stand-alone sessions but as a series provide a well-rounded group of nature and farmed based activities. You may register for any or all. Parents: Register under your name and fill in your child's name in the space provided at registration. This is a drop off class - you are welcome to relax on the porch, take a stroll on the property, leave and return, or if space allows, observe the class. Classes run Sundays from 2:30pm-4:00pm. Come on a short hiking exploration where children will be encouraged to observe, hear, and feel the natural environment and their existence as a part of it! Play an investigative game of what things in our environment might be trying to tell us. We will talk about the interconnected web of life, the trees, water, bugs, wildlife, and sunlight and the importance of all of these elements to life (including ours). We will also get our hands in the dirt for some planting, gaining an understanding of how nature can support us and doing our best to provide a life-sustaining environment for the plants. What does it mean to leave no trace and why is it even important? Examine what seemingly small things in our environment could actually be full habitats and how we can interact with them in a non-disruptive way. We will be picking up some muddy rocks and sifting through some dirt for this one, please dress appropriately. We will also look for bugs and worms in the garden and discuss how things that sometimes seem yucky can actually be important to sustaining life. Explore the healing powers of plants: trees, flowers, and more! Be prepared, you might be asked to hug a tree! Children will be encouraged to experience the vibrational energy of the flowers that grow on Horn Farm in a variety of colors and shapes! A game will be played to illustrate how this energy affects us and how we can share it with one another as we interact! We will also explore the healing nature of herbs and even create an herbal salve based on what is available at the time. We take care to harvest all herbs in a way that is life-sustaining to the plant and children leave with the understanding that we can use these natural resources without depleting them. Come harvest and prepare some yummy and nutritional snacks for yourself! Kimber will use her skills as a former Executive Chef to guide kids through the preparation of a snack they will enjoy! All ingredients will be harvested in a way that is careful not to harm the plant, and we will talk about how nurturing the plants comes back to us. Kids will also get to plant some herbal seeds of their own to take home. Kimber Bowers - As a Holistic Practitioner, Nature Enthusiast, and Growth and Empowerment Expert, Kimber Bowers seeks to encourage others to embrace their growth and develop a full expression of the beauty within through establishing a strong sense of connection to one another, ourselves, and the natural environment in which we live, developing resiliency, compassion, and a desire for eco-friendly living in the process. A diverse background in Holistic Modalities, Speaking, Cooking, Scouting, Sustainable Living, and having been a kid herself (can you believe that? ), gives her a unique ability to meet children where they are and encourage them to expand their own way of thinking through fun and interactive activities! Kimber is a Certified Executive Chef and Certified Holistic Nutritionist.